Most beginners jump into the forex trading business because they are tempted to profit or profit generated from the forex business. Yes ... with a forex business we can make big profits in a relatively fast time compared to other businesses. 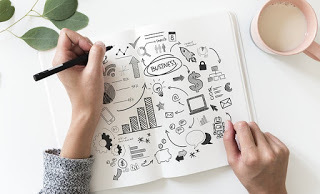 But to be able to make a profit is not as easy as it is seen, because it needs to know and master how to analyze forex price movements appropriately. It takes the best forex trading strategy so that profits are consistent or always profit, both for scalping techniques and daily morning trading. Forex trading is a trading system that can generate two-way profits, meaning that we can get a profit when an asset price is rising or falling. So we only have to be able to predict whether a price movement will rise or will decrease from the current price. And to predict it there are two kinds of analysis, namely fundamental analysis and technical analysis. What we will discuss is technical analysis using indicators. For the actual center line is exactly the same as the Moving Average indicator line with a period of 20. That acts as the basis for the calculations for Upper bands and Lower bands. 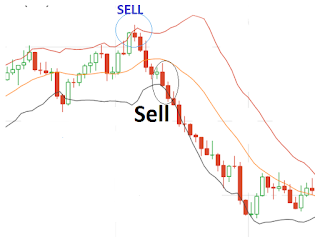 Bollinger bands indicators can be used to find out if a market is crowded or quiet. The size of the distance between the line at the top (Upper bands) with the bottom line (Lower bands) is influenced by the level of price volatility that is happening in the forex market. Will the price reverse direction (bounce / bounce)? 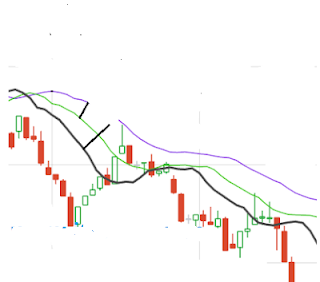 As we discussed above the bollinger bands indicator serves to analyze the price volatility that is happening. Price movements will tend to bounce after touching the top line (Upper bands) or lower bands with the center line as the target. In this case the price will not pass from the Upper bands and Lower bands, so we can use this signal to make order decisions on forex trading. How to read it is very easy enough to see when the movement of the candlestick touches the upper line it is predicted that the price will turn towards the middle bands or to the lower bands. Important Note: This method only applies when the market is stable, because when market volatility is high, the above method becomes dysfunctional. Then how do you know the market is stable and high volatility? For a market that tends to be stable, it is indicated by the direction of movement of the Upper bands and the Lower bands tend to be parallel or not leading to a sharp slope as shown above. 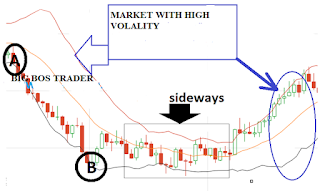 In contrast to the market with high volatility its appearance is indicated by the two lines of Upper bands and Lower bands that are like to open / spread away, by pointing to the movement of certain trends whether it is up / down or down / down as shown above (right and left). The movement of the bollinger bands line tends to widen when the forex market is busy and narrows when forex is quiet. Besides the strategy that prices tend to bounce / reverse direction after the candlestick touches the Upper bands and Lower bands line which only applies when the market is stable / consolidated. But it is not always when the price touches the Upper bands and Lower bands line the price movements will then reverse direction. It could continue the trend / continuation direction. 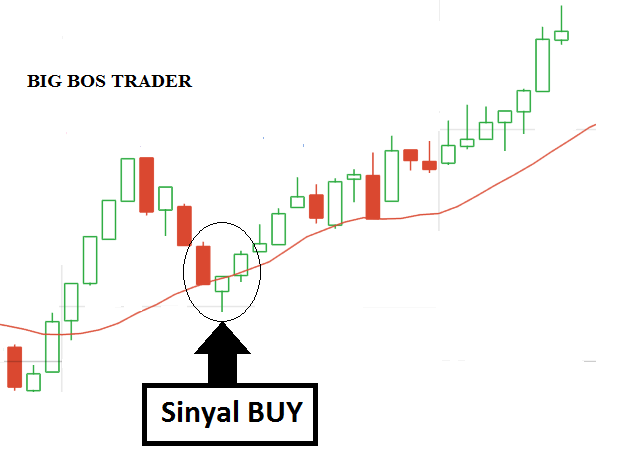 That is why when determining the entry point for Buy orders must wait for the formation of a whole bullish / ascending candlestick (white), to anticipate if the price does not reverse. That is a sign of price movement will be downward / downtrend. To order Buy, the way it works is almost the same, only the trend movement is upward. Easy isn't it? how to read and use the bollinger bands indicator to predict the direction of forex. If there are still difficulties, I will provide additional Bollinger Bands strategies to simplify forex movement analysis. Each price movement must form a zigzag with a valley point and a peak point. To draw the least trendline line, it takes 2 valley points or 2 peak points. The picture above the trendline line has been broken by the price. Before the trendline line has been broken, the trend is going up / uptrend, but when the trendline has been broken, there will be a trend reversal. Previously the upptrend was downtrend. We can order SELL at the point where the trend line is broken by waiting for confirmation of a bearish candlestick formation (red) below the trendline line. 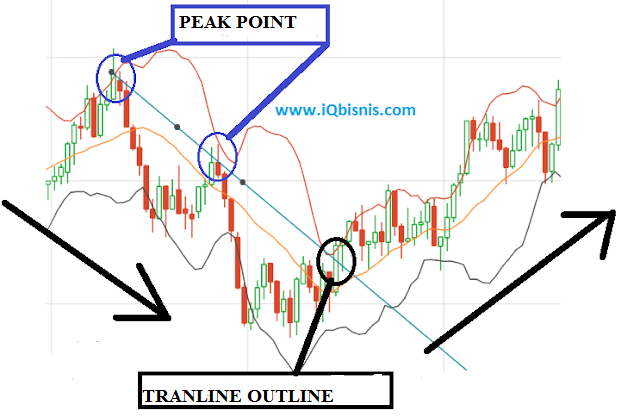 It takes at least 2 peak points to draw a trend line on downtrend price movements. 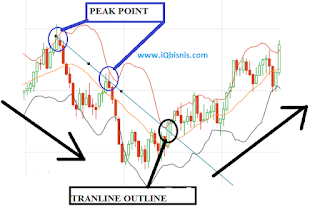 The trend movement will reverse direction when the trendline line has been penetrated. Thus we can order BUY at the price where the trendline line has been broken, by waiting for the formation of a white candlestick above the trendline. That is forex analysis strategy using candlestick Bollinger bands, practice with a demo account first to adjust to your trading style. 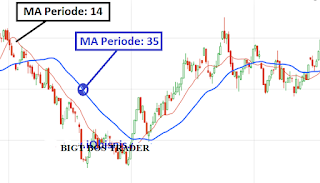 The function of the Moving Average indicator is to determine trends, and predictions of price movements will reverse or continue when they reach a certain price range. We are free to choose the type of MA that we like, that is, you can choose SMA or MA (free) with the default settings, without changing anything. 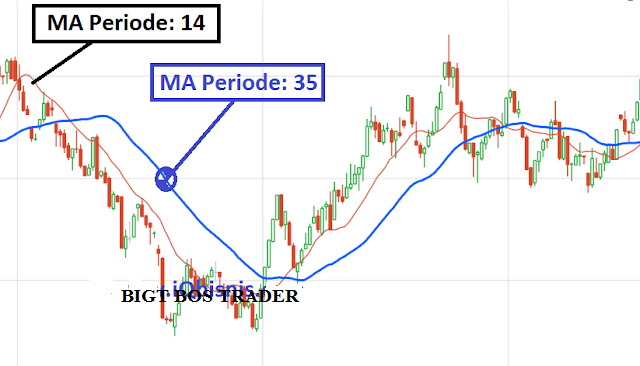 When a bullish candlestick (white) is formed from below the MA line, then closes above the MA line (as in the picture), then the next move tends to be bullish. Don't forget to put a stop loss on the lowest level of the candlestick that breaks the MA line. When a bearish candlestick (red) is formed from above the MA line, then closes below the MA line (as in the picture), then the next movement tends to be bearish. Don't forget to put a stop loss at the highest level of the candlestick that breaks the MA line. The bouncing strategy is the strategy of reading the movement of the analysis using the Moving Average, where a price movement when touching the MA line, the price will bounce back (reversal). Briefly this strategy describes when forex price movements are not able to penetrate the Moving Average line so that it becomes bouncing. To see the signals that emerge from this strategy it is very easy to simply monitor the appearance of a candlestick that approaches the Moving Average line. The price movement is rising (bullish / uptrend), then a bullish (white) candlestick is formed which is closed just in line with the Moving Average. But the next candlestick is bearish / down (red) candle which finally reverses the direction of forex prices. Price movement is down / bearish, then a bearish candlestick is formed (red) which is closed just in line with the Moving Average. But the next candlestick is a bullish (white) candle which finally reverses the direction of forex prices. 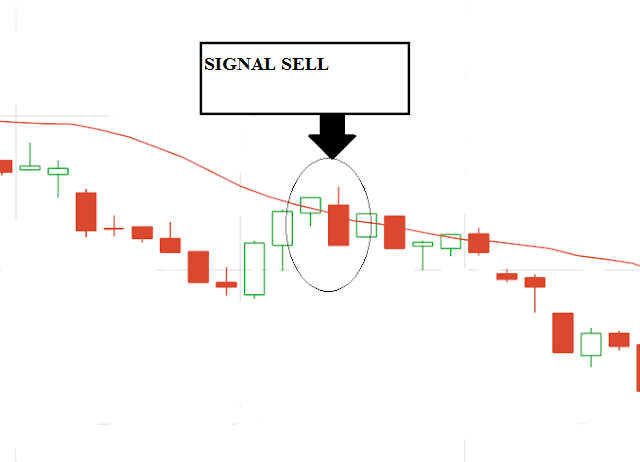 This strategy is to determine the entry point in an open position by waiting for the moment of signal to be reversed. When the period 14 MA line (red) is below the period 35 MA line (blue) means there is a downtrend / downtrend. Wait for the MA line with Period 14 to penetrate the MA line with Period 35. This method is very effective on a trendy market, both in the upward and downward trend movements. And is suitable for scalping trading styles. This method can also be applied when we have missed the opportunity to open a position with the CrossOver Moving Average strategy above. Wait until the two MA lines have the same slope (will form a trend). Or when after the red MA line (14) intersects the blue MA line (35). 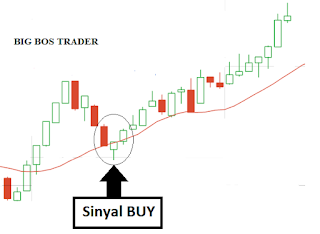 Make a BUY order when the price / candlestick enters the area (yellow) between the two lines of the Moving Average indicator. In accordance with the name of the indicator (Alligator), how to read this indicator is also like an alligator. To make it easier to read the signal, we must remember the color of each indicator line, the most important thing is to remember the color of the LIP line. Color settings can be set according to the favorite color to make it more comfortable. When all three indicator lines (jaw, teeth, lips) are close together, the Alligator is overflowing / falling asleep, and it is not recommended to open a trading position at a time like this. The more alligators eat, the longer he sleeps. 0 Response to "Collection of Forex Trading Strategies Most Accurate Indicators Are Always Consistent"